I slept poorly that night, sinuses filling constantly with bloody discharge, and cough triggering whenever I rolled from side to side (I am strictly a side sleeper). Plus, my ribcage hurt like crazy whenever I coughed or rolled over… in summary, not a great night. 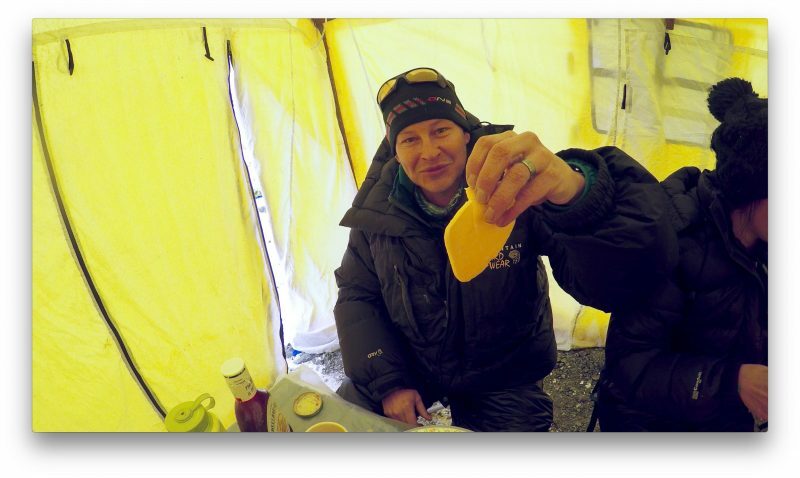 BUT, the comforts of Camp 2 were alluring (meal tent, toilet tent), so I was motivated to get crackin’ early. I kept my pledge from yesterday to cover the rear vestibule floor with fresh snow… it will melt, of course, revealing the bloody mosaic in a creepy process in the coming days, but at least I’m trying to do the right thing. So, this was a challenging day. I got through it by walking intentionally, very very slowly, almost as a physiological experiment. How slowly can I go without my body thinking we are stopped and thus triggering a coughing fit? My guide and mentor and savior was the lovely and super strong, super talented Emily Johnston. “You’re going too fast. You’re a rabbit chasing the carrot. Stop it.” I put Pasang Kami in front. Then I went in front. When that did not satisfy her, she put herself in front and reduced pace to one step every three seconds. Period. No wiggle room upwards. “How’s the pace?” she would ask. And on and on. The wind hit us at one point beyond Nuptse Corner, and I needed to stop in order to put on a layer. I watched with melancholy as the pod of teammates just ahead of us walked majestically away into the ground blizzard. I would not see them again until we reached camp. 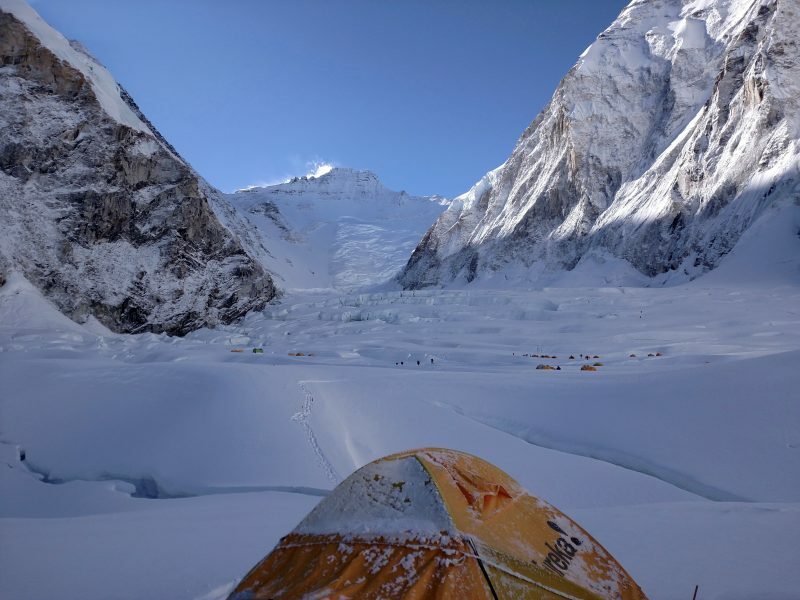 The distance between camps is just under two miles as the crow flies (yes, there are crows up there), but longer considering the maneuvering we make around crevasses. Time ticked by so painfully. But, I must admit that my lungs felt better than I had thought possible. 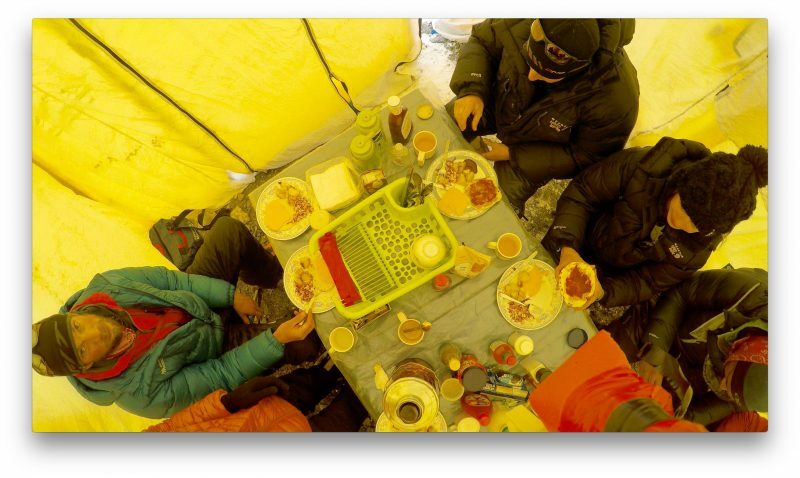 When we reached the base of Camp 2, and the terrain pitched up a bit steeper, the sun finally began to show itself, and it was necessary to drop layers and settle in for a grinding cap to the day. IMG Camp 2 is situated at the top of the moraine, and it literally took us over an hour to make it there from the time we passed the bottommost tent—which is crazy long. Emily stuck with me every step of the way, as did Pasang Kami. 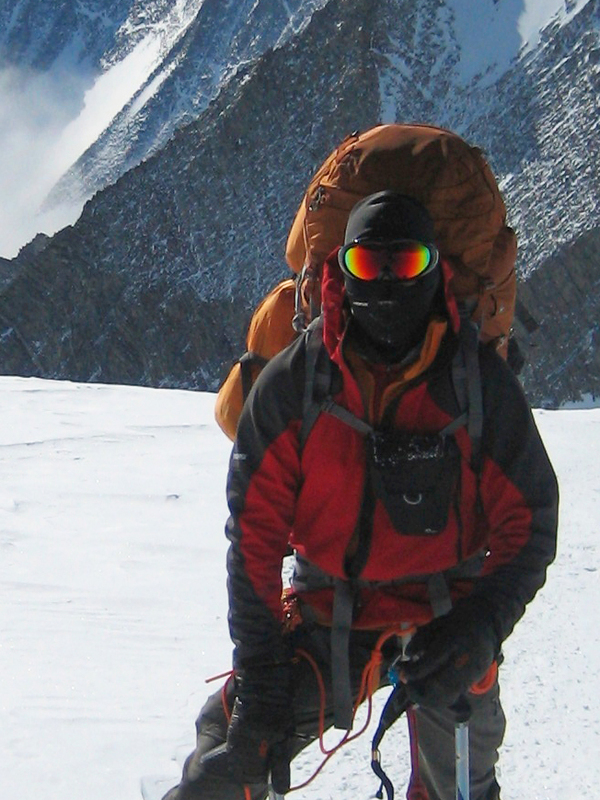 I felt so badly for this elite Sherpa athlete that eventually we implored him to bolt ahead and get to camp. He did so… but backtracked a short time later with a thermos of hot tea, and insisted on carrying my backpack into camp. I was so ground down that I happily acquiesced. We have been through tough times before, meaning the quake last year, and I would like to think that our history informs part of his generosity with me. On the other hand, that is the Sherpa ethos, and I suspect he would work this hard for whichever climber was assigned to him. Either way, I was very impressed with Pasang Kami and am super grateful. 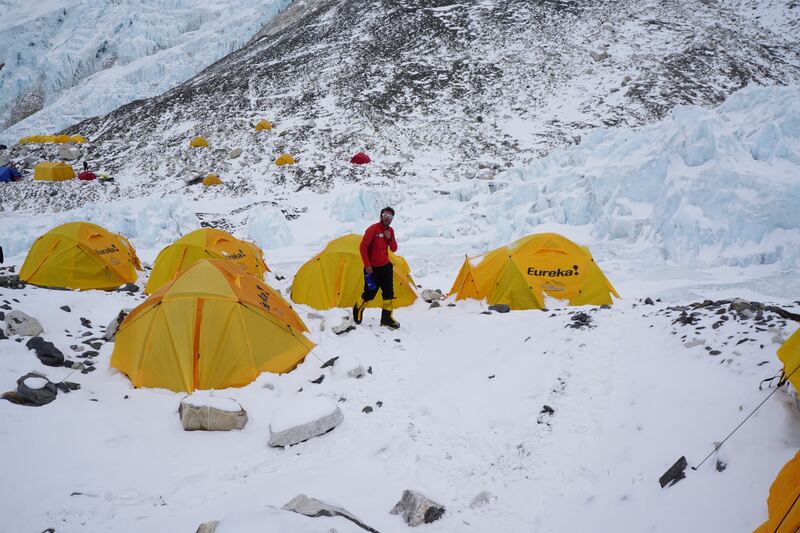 This was not the way I wanted to pull into Camp 2, but our goal had been slow and steady, and we accomplished that. Again, I must emphasize the incredible guidance from Emily Johnston. There are very few guides in the world who would have the patience, gumption, moxie, and dedication to stick with a sick climber the way she did, literally pacing every step, hour after hour, above 20,000 feet. Typical of IMG to have someone of this caliber on the payroll. Exceptional among guides the world around. The prospect of heading up to Camp 3 the next morning was serious for me, because I felt quite exhausted. 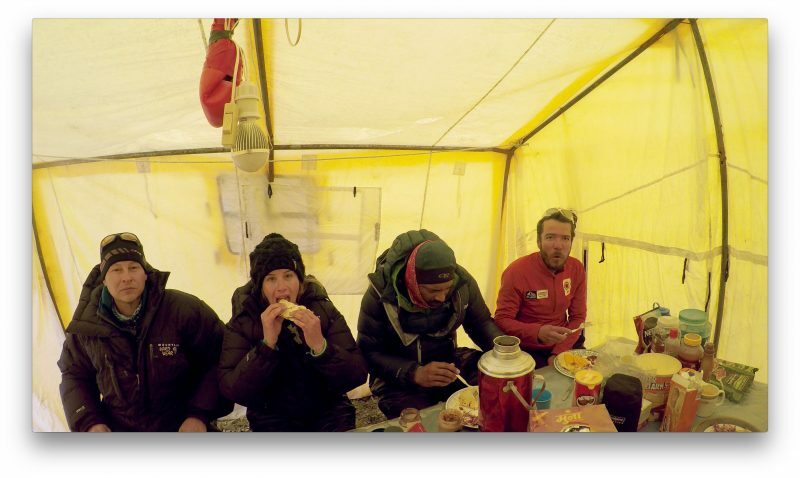 However, I was not alone in feeling poorly that day, and IMG being climber-focused allowed us to expand the rotation by a day before moving to Camp 3. Some guiding outfits would not give a damn whether everyone in the party was ready to go. But our goal is universal safety and success, and so a rest day was added. As I settled in for the night, I thought for the umpteenth time, Thank goodness I chose IMG. 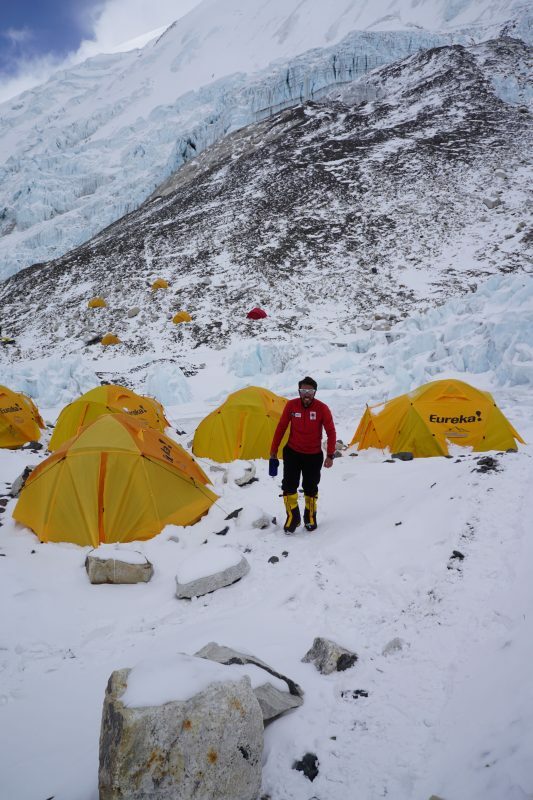 Cristiano makes his way to the dinner tent at Camp 2. This is the only photo I had the energy to take between Camp 1 and 2. I’m not sure what happened to me that night—perhaps exhaustion simply overwhelmed me. Somehow I slept very, very soundly. In fact, this was the first time I could recall sleeping longer that 45 minutes at a stretch in over a week. I awoke feeling refreshed and restored—I had literally forgotten what that felt like. This made me very optimistic for the possibility of improving during rest day. The agenda: Eat, drink, rest, pack. 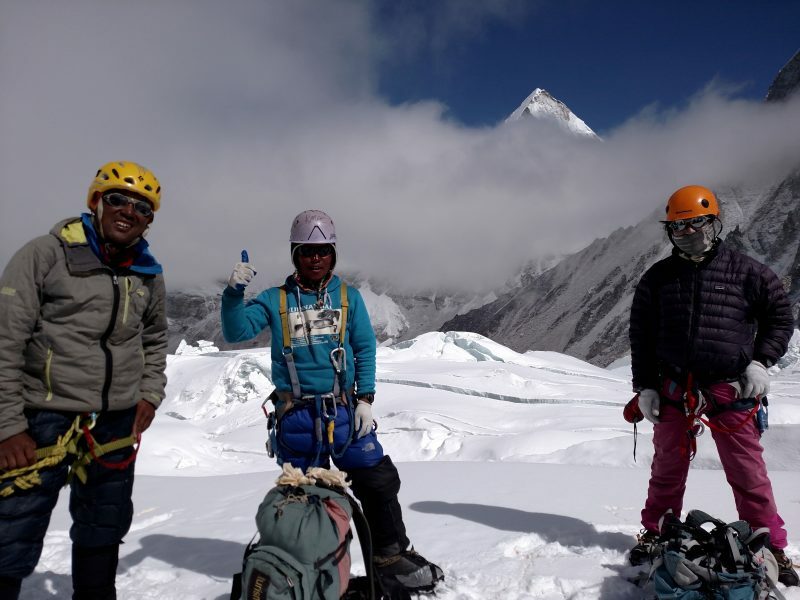 We watched streams of climbers head up the Lhotse face towards Camp 3. I was stunned to see the route they took: Rather than sticking to the smooth left-hand portion of the face, they went up over bulges of blue ice to the right. My heart sank when I saw this, because it looked so exhausting and time-consuming. On the open slope, one could hope to develop a rhythm and grind out a huge staircase. BUT, the open slope is also exposed to avvy and rockfall risk… thus, the safe but painful option of going right. 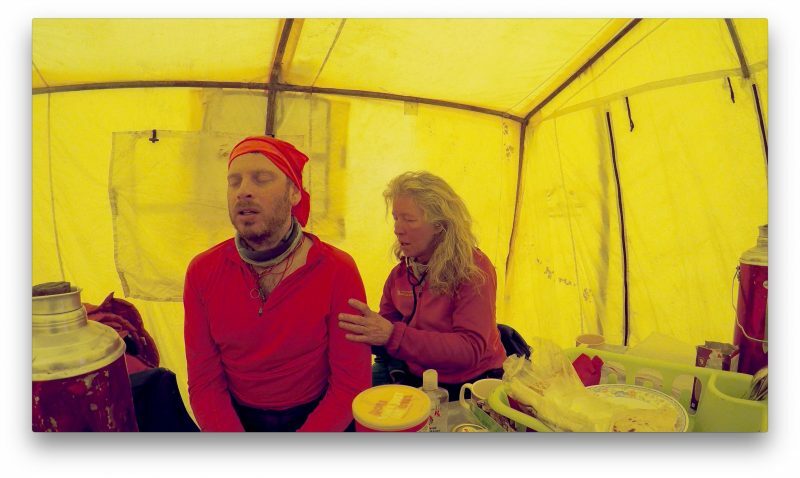 Knowing that we would sleep at Camp 3—23,700 feet—without supplementary O2 was equally daunting. Girding up the loins in my mind, I settled in for a few hours of sleep after dinner. I have waited my entire life to climb Everest. After the icefall, no terrain feature has dominated my imagination more than the Lhotse Face. My cough and sinus discharge were down a bit. Enough to get me safely up and back? The morning would tell. Concept of the day: Dreaming of the Face. Paul, so happy you have Em there to keep you slow and steady. We are sending our affection back to both of you! Paul, I am helping Linda her sinuses with one of those rinse treatments. We’ll be thinking of you getting a good night’s sleep and your sinuses miraculously cleared. Great POV, and much appreciated Doug! Feel better. Emily must be an angel! We are grateful she is there with you. The issue: poor gas equilibration from snow and ice on tent walls or frozen vapor from breath, human produced C02 sinking to floor as heavier than air. Keep vent open a bit. Thanks for posting that, Dave! I especially appreciated the part about not always whizzing in a pee bottle. Yes! This makes sense to me! Frustrating that it still happens with vents open, but that’s because some of the nights up here are so incredibly still…. Thanks! Emily’s friends are proud of her and you! Yup. She is the best! Thanks for this….